Please read this in conjunction with today's earlier post. Jan (she who must be obeyed) and KevinToo have both mentioned they cannot see the photos in the post I published earlier today. Jan is using her Android tablet and Google Chrome. I am using Opera browser (my usual browser) on the laptop and can see the photos. If I use Firefox on the laptop I do not see the photos. But I do see the photos from the previous post (Wed 30th). If I use Google Chrome on the laptop I don’t see today’s photos but I do see those from Wednesday and earlier. When I load Blogger and look at today’s post the photos are there. 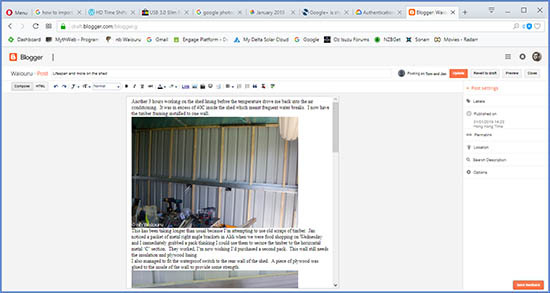 So my Method 3 allows me to insert photos into Open Live Writer and when I publish the post from Open Live Writer the photos appear in the editing screen of Blogger. However Blogger WILL NOT show the photos on some browsers. This has happened in the last 24 hours and it has to be Google. I'm looking for answers and a solution. I've given up with the photos thing. Too many variables and too many inconsistent results like it works one day but not the next. I'm hoping that Google are eventually going to sort it. But we are also considering switching the Oleanna blog to Wordpress as that still works ok with OLW. I do have sympathy with you regarding the 40 degrees. We have no deggrees what so ever here in Newark, in fact it was a good few less than none at all last night. I have also looked at Wordpress. But I don't particularly want to pay for server space. I thought Wordpress was like Blogger and came with it's own "free" web storage.. I'm guessing it must do, as I use WordPress to store backups of my Blogger pages and I don't pay for anything? Have I found a solution?